Ebstein anomaly is a rare congenital cardiac defect/malformation. The primary pathologic finding is abnormal development of the tricuspid valve marked by a downward displacement of the annular attachments of the septal and posterior leaflets of the tricuspid valve into the inlet portion of the right ventricle (see the image below). This downward displacement of the leaflets reduces the distal chamber of the right ventricle, leaving part of the ventricle above the valve as an extension of the right atrium. The entire wall of the right ventricle, both above and below the tricuspid valve, is often thin, dilated, and dysfunctional. In most patients, annular dilatation and malformation of the leaflets result in moderate-to-severe insufficiency of the tricuspid valve. Most patients have an atrial septal defect or a patent foramen ovale, which allows predominant right-to-left shunting at the atrial level. A high incidence of atrial and ventricular arrhythmia, including an association with Wolff-Parkinson-White Syndrome, occurs in these patients. Anatomic features of Ebstein anomaly. Note the atrialized portion of the right ventricle and displacement of the tricuspid valve. AV = atrioventricular. Ebstein anomaly is characterized by remarkable morphologic variability and a broad spectrum of clinical presentations. Consequently, the diagnosis of Ebstein anomaly may be made in symptomatic newborn infants, young adults, or middle-aged adults, depending on the severity of the defect and clinical manifestations. This defect accounts for less than 1% of all congenital heart disease. Geographic variation in the prevalence of this defect, inside or outside the United States, has not been documented. Although no increase in prevalence has been documented, an improvement in diagnostic techniques has led to earlier diagnosis. The anomaly occurs in both sexes with equal frequency. The individual valve leaflets may be larger or smaller than expected. The chordae tendineae and papillary muscles are often abnormal in their number, development, and location. In rare instances, the anterior leaflet may attach to the apical region of the right ventricle and obstruct blood flow through the right ventricular outflow tract. Additionally, the tricuspid annulus is usually enlarged to 2-4 times the normal size. Anatomic features of Ebstein anomaly are presented in the image below. The displacement of the septal and posterior leaflets of the tricuspid valve into the right ventricle leaves a portion of the right ventricular wall between the leaflet attachments and the true annulus in continuity with the right atria. This atrialized right ventricle is usually very thin and dilated with a decrease in the actual number of myocardial fibers. The functional right ventricle below the valve may also be thin and dilated with decreased contractile function. The right atrium is enlarged and may reach enormous size. An atrial septal defect is usually present and ranges from a patent foramen ovale to a large secundum defect. The coronary arteries are normal in distribution, and the right coronary artery is often displaced by the enlarged right atrium and atrialized right ventricle. Associated cardiac anomalies include pulmonary stenosis or atresia, ventricular septal defect, patent ductus arteriosus, tetralogy of Fallot, and coarctation of the aorta. [4, 16] In patients with Wolff-Parkinson-White syndrome, accessory pathways are typically the atrioventricular type and are localized to the right ventricular free wall or to the posterior interventricular septum (bundles of Kent). Ebstein anomaly of the left atrioventricular valve occurs in up to 75% of patients with L-transposition of the great arteries or corrected transposition of the great arteries. In these patients, displacement of the septal and posterior leaflets is similar to that in right-sided lesions, but the anterior leaflet is usually smaller. In addition, the wall of the functional right ventricle is rarely thin and dilated, and the wall of the atrialized right ventricle is also less thin and dilated. Left-sided accessory pathways have been described only in those patients with Ebstein anomaly of the left-sided atrioventricular valve. In most patients, the tricuspid valve is incompetent with some degree of functional impairment of the right ventricle. The atrialized right ventricle paradoxically moves with right atrial and right ventricular contractions. The net effect is reduced forward blood flow through the right ventricle and pulmonary arteries. The impaired filling of the functional right ventricle and the incompetence of the tricuspid valve both result in systemic venous hypertension. The right atrium and the atrialized right ventricle become dilated, often to extreme proportions. In most patients, right-to-left shunting occurs across a defect in the atrial septum and results in cyanosis. The presence of pulmonary hypertension in neonates increases this atrial shunting and can lead to profound cyanosis in newborn infants. In some neonates, right ventricular outflow tract obstruction and pulmonary stenosis or atresia may result in a completely ductal-dependent pulmonary circulation. Both atrial arrhythmias and ventricular arrhythmias may contribute to impaired right ventricular function. Although the primary pathology involves the right ventricle, patients with Ebstein anomaly may also demonstrate abnormal left ventricular geometry and function. The severity of left ventricular dysfunction is associated with the degree of displacement of the tricuspid valve, the size and dysfunction of the right ventricle, and the severity of paradoxical motion of the interventricular septum. The exact embryologic cause of Ebstein anomaly is unknown. The tricuspid valve leaflets form by a process of delamination of the inner layers of the inlet portion of the right ventricle. Evidence suggests that the anterior leaflet forms earlier in development than the septal and posterior leaflets. In Ebstein anomaly, the insertions of the septal and posterior leaflets are displaced to the junction of the inlet and trabecular portions of the right ventricle, indicating abnormal delamination. The insertion of the anterior leaflet is at the level of the true annulus. The right ventricle endocardium is often thickened and fibrotic, suggesting that formation of the valve leaflets was interrupted prior to completion of the delamination process. The tricuspid valve is usually incompetent, but it may also be stenotic or even imperforate. In addition, both the atrialized right ventricular wall and the functional right ventricular wall may be abnormally thin and fibrotic. Parents and/or patients with Ebstein anomaly should be informed that surgery is often required in the presence of symptoms. However, some infants with severe heart dysfunction may not be candidates for surgical repair but may be better suited for a heart transplant. In addition, for those patients who do undergo repair of the anomaly, multiple surgeries may be required in the future. For patient education resources, see the Heart Health Center, as well as Tetralogy of Fallot, Palpitations (Causes, During Pregnancy, Symptoms, Treatment, Ventricular Septal Defect, Atrial Fibrillation (AFib), Congestive Heart Failure, Pleurisy (Pain, Symptoms, Causes, Treatment, and High Blood Pressure (Symptoms, Sings, Causes, Diet, Medication). Hong YM, Moller JH. Ebstein's anomaly: a long-term study of survival. Am Heart J. 1993 May. 125(5 Pt 1):1419-24. [Medline]. Ebstein W. Ueber einen sehr seltenen Fall von Insufficienz der Valvula Tricuspidalis bedingt durch eine angeborene hochgradige Missbildung derselben [German]. Arch Anat Physiol. 1866. 33:238.
van Son JA, Konstantinov IE, Zimmermann V. Wilhelm Ebstein and Ebstein's malformation. Eur J Cardiothorac Surg. 2001 Nov. 20(5):1082-5. [Medline]. Watson H. Natural history of Ebstein's anomaly of tricuspid valve in childhood and adolescence. An international co-operative study of 505 cases. Br Heart J. 1974 May. 36(5):417-27. [Medline]. Hunter SW, Lillehei CW. Ebstein's malformation of the tricuspid valve; study of a case together with suggestion of a new form of surgical therapy. Dis Chest. 1958 Mar. 33(3):297-304. [Medline]. Hardy KL, May IA, Webster CA, Kimball KG. Ebstein's anomaly: A functional concept and successful definitive repair. J Thorac Cardiovasc Surg. 1964 Dec. 48:927-40. [Medline]. Barnard CN, Schrire V. Surgical correction of Ebstein's malformation with prosthetic tricuspid valve. Surgery. 1963 Aug. 54:302-8. [Medline]. Danielson GK, Maloney JD, Devloo RA. Surgical repair of Ebstein's anomaly. Mayo Clin Proc. 1979 Mar. 54(3):185-92. [Medline]. Carpentier A, Chauvaud S, Mace L, et al. A new reconstructive operation for Ebstein's anomaly of the tricuspid valve. J Thorac Cardiovasc Surg. 1988 Jul. 96(1):92-101. [Medline]. Hetzer R, Nagdyman N, Ewert P, et al. A modified repair technique for tricuspid incompetence in Ebstein's anomaly. J Thorac Cardiovasc Surg. 1998 Apr. 115(4):857-68. [Medline]. Quaegebeur JM, Sreeram N, Fraser AG, et al. Surgery for Ebstein's anomaly: the clinical and echocardiographic evaluation of a new technique. J Am Coll Cardiol. 1991 Mar 1. 17(3):722-8. [Medline]. Starnes VA, Pitlick PT, Bernstein D, Griffin ML, Choy M, Shumway NE. Ebstein's anomaly appearing in the neonate. A new surgical approach. J Thorac Cardiovasc Surg. 1991 Jun. 101(6):1082-7. [Medline]. Itatani K, Miyaji K, Inoue N, Ohara K. Ebstein anomaly associated with double-orifice tricuspid valve. J Thorac Cardiovasc Surg. 2010 Jun. 139(6):e131-3. [Medline]. Danielson GK, Driscoll DJ, Mair DD, Warnes CA, Oliver WC Jr. Operative treatment of Ebstein's anomaly. J Thorac Cardiovasc Surg. 1992 Nov. 104(5):1195-202. [Medline]. Gentles TL, Calder AL, Clarkson PM, Neutze JM. Predictors of long-term survival with Ebstein's anomaly of the tricuspid valve. Am J Cardiol. 1992 Feb 1. 69(4):377-81. [Medline]. Kumar AE, Fyler DC, Miettinen OS, Nadas AS. Ebstein's anomaly. Clinical profile and natural history. Am J Cardiol. 1971 Jul. 28(1):84-95. [Medline]. Anderson KR, Danielson GK, McGoon DC, Lie JT. Ebstein's anomaly of the left-sided tricuspid valve: pathological anatomy of the valvular malformation. Circulation. 1978 Sep. 58(3 Pt 2):I87-91. [Medline]. Zalzstein E, Koren G, Einarson T, Freedom RM. A case-control study on the association between first trimester exposure to lithium and Ebstein's anomaly. Am J Cardiol. 1990 Mar 15. 65(11):817-8. [Medline]. Stulak JM, Dearani JA, Danielson GK. Surgical management of Ebstein's anomaly. Semin Thorac Cardiovasc Surg Pediatr Card Surg Annu. 2007. 105-11. [Medline]. Chauvaud S, Fuzellier JF, Berrebi A, et al. Bi-directional cavopulmonary shunt associated with ventriculo and valvuloplasty in Ebstein's anomaly: benefits in high risk patients. Eur J Cardiothorac Surg. 1998 May. 13(5):514-9. [Medline]. Knott-Craig CJ, Overholt ED, Ward KE, Razook JD. Neonatal repair of Ebstein's anomaly: indications, surgical technique, and medium-term follow-up. Ann Thorac Surg. 2000 May. 69(5):1505-10. [Medline]. Dinckal MH, Davutoglu V, Soydinc S, Sezen Y. Radiofrequency current catheter ablation of accessory pathway in Ebstein's anomaly and a review of the literature. Turk Kardiyol Dern Ars. 2003 April. 31(4):239-43. [Full Text]. Lincoln T, Stewart C, Shah P. An unusual first presentation of Ebstein's anomaly in a 72-year-old patient. Ann Thorac Surg. 2012 Feb. 93(2):e19-20. [Medline]. Ghosh S, Avari JN, Rhee EK, Woodard PK, Rudy Y. Noninvasive electrocardiographic imaging (ECGI) of epicardial activation before and after catheter ablation of the accessory pathway in a patient with Ebstein anomaly. Heart Rhythm. 2008 Jun. 5(6):857-60. [Medline]. Healy C, Tanawuttiwat T, Viles-Gonzalez JF. Putting a name on it: Ebstein's anomaly. Am J Med. 2015 Apr. 128 (4):367-8. [Medline]. Celermajer DS, Dodd SM, Greenwald SE, Wyse RK, Deanfield JE. Morbid anatomy in neonates with Ebstein's anomaly of the tricuspid valve: pathophysiologic and clinical implications. J Am Coll Cardiol. 1992 Apr. 19(5):1049-53. [Medline]. Patel V, Nanda NC, Rajdev S, et al. Live/real time three-dimensional transthoracic echocardiographic assessment of Ebstein's anomaly. Echocardiography. 2005 Nov. 22(10):847-54. [Medline]. Chauvaud S, Berrebi A, d'Attellis N, Mousseaux E, Hernigou A, Carpentier A. Ebstein's anomaly: repair based on functional analysis. Eur J Cardiothorac Surg. 2003 Apr. 23(4):525-31. [Medline]. da Silva JP, Baumgratz JF, da Fonseca L,et al. The cone reconstruction of the tricuspid valve in Ebstein's anomaly. The operation: early and midterm results. J Thorac Cardiovasc Surg. 2007 Jan. 133(1):215-23. [Medline]. Dearani JA, Said SM, O'Leary PW, Burkhart HM, Barnes RD, Cetta F. Anatomic repair of Ebstein's malformation: lessons learned with cone reconstruction. Ann Thorac Surg. 2013 Jan. 95(1):220-6; discussion 226-8. [Medline]. Wu Q, Huang Z. A new procedure for Ebstein's anomaly. Ann Thorac Surg. 2004 Feb. 77(2):470-6; discussion 476. [Medline]. Nakata T, Fujimoto Y, Hirose K, Tosaka Y, Ide Y, Sakamoto K. Norwood procedure combined with the Starnes procedure. Ann Thorac Surg. 2008 Oct. 86(4):1378-80. [Medline]. Kawabata T, Kasahara S, Arai S, Sano S. Right ventricular exclusion for a neonatal patient with Ebstein anomaly: a free wall resection of the right ventricle. J Thorac Cardiovasc Surg. 2011 Dec. 142(6):1582-4. [Medline]. Kotoulas C, Jones RP, Turkie W, Hasan R. Edge-to-edge repair of tricuspid valve in a corrected transposition of the great vessels. Hellenic J Cardiol. 2008 Nov-Dec. 49(6):434-6. [Medline]. Barbara DW, Edwards WD, Connolly HM, Dearani JA. Surgical pathology of 104 tricuspid valves (2000-2005) with classic right-sided Ebstein's malformation. Cardiovasc Pathol. 2008 May-Jun. 17(3):166-71. [Medline]. Brown ML, Dearani JA, Danielson GK, et al. Comparison of the outcome of porcine bioprosthetic versus mechanical prosthetic replacement of the tricuspid valve in the Ebstein anomaly. Am J Cardiol. 2009 Feb 15. 103(4):555-61. [Medline]. Kiziltan HT, Theodoro DA, Warnes CA, O'Leary PW, Anderson BJ, Danielson GK. Late results of bioprosthetic tricuspid valve replacement in Ebstein's anomaly. Ann Thorac Surg. 1998 Nov. 66(5):1539-45. [Medline]. Tanaka M, Ohata T, Fukuda S, Kigawa I, Yamashita Y, Wanibuchi Y. Tricuspid valve supra-annular implantation in adult patients with Ebstein's anomaly. Ann Thorac Surg. 2001 Feb. 71(2):582-6. [Medline]. Milgalter E, Laks H. Use of a pericardial patch to bridge the conduction tissue during tricuspid valve replacement. Ann Thorac Surg. 1991 Dec. 52(6):1337-9. [Medline]. Glenn WW, Browne M, Whittemore R. Circulatory bypass of the right side of the heart: Cavo-pulmonary artery shunt-Indications and results (report of a collected series of 537 cases). Cassels DE, ed. The heart and circulation in newborn and infant. New York, NY: Grune & Stratton; 1966. 345-57. Marianeschi SM, McElhinney DB, Reddy VM, Silverman NH, Hanley FL. Alternative approach to the repair of Ebstein's malformation: intracardiac repair with ventricular unloading. Ann Thorac Surg. 1998 Nov. 66(5):1546-50. [Medline]. Liu J, Qiu L, Zhu Z, Chen H, Hong H. Cone reconstruction of the tricuspid valve in Ebstein anomaly with or without one and a half ventricle repair. J Thorac Cardiovasc Surg. 2011 May. 141(5):1178-83. [Medline]. Celermajer DS, Bull C, Till JA, et al. Ebstein's anomaly: presentation and outcome from fetus to adult. J Am Coll Cardiol. 1994 Jan. 23(1):170-6. [Medline]. Brown ML, Dearani JA, Danielson GK, Cetta F, Connolly HM, Warnes CA, et al. The outcomes of operations for 539 patients with Ebstein anomaly. J Thorac Cardiovasc Surg. 2008 May. 135(5):1120-36, 1136.e1-7. [Medline]. Danielson GK. Ebstein's anomaly: Historical aspects and current management. AHA Cardiothoracic and Vascular Newsletter. 2000. Brown ML, Dearani JA, Danielson GK, Cetta F, Connolly HM, Warnes CA, et al. Functional status after operation for Ebstein anomaly: the Mayo Clinic experience. J Am Coll Cardiol. 2008 Aug 5. 52(6):460-6. [Medline]. Theodoro DA, Danielson GK, Kiziltan HT, et al. Surgical management of Ebstein’s anomaly: a 25-year experience. Circulation. 1997. 96 suppl I:1-507. Chen JM, Mosca RS, Altmann K, et al. Early and medium-term results for repair of Ebstein anomaly. J Thorac Cardiovasc Surg. 2004. 127 (4):990-8. [Medline]. Muller J, Kuhn A, Vogt M, Schreiber C, Hess J, Hager A. Improvements in exercise performance after surgery for Ebstein anomaly. J Thorac Cardiovasc Surg. 2011 May. 141(5):1192-5. [Medline]. Boston US, Dearani JA, O'Leary PW, Driscoll DJ, Danielson GK. Tricuspid valve repair for Ebstein's anomaly in young children: a 30-year experience. Ann Thorac Surg. 2006 Feb. 81(2):690-5; discussion 695-6. [Medline]. Kajihara N, Asou T, Takeda Y, et al. Rapid two-stage Starnes procedure for a symptomatic neonate with Ebstein anomaly. Ann Thorac Surg. 2010 Dec. 90(6):2073-5. [Medline]. Shinkawa T, Polimenakos AC, Gomez-Fifer CA, et al. Management and long-term outcome of neonatal Ebstein anomaly. J Thorac Cardiovasc Surg. 2010 Feb. 139(2):354-8. [Medline]. Luxford JC, Arora N, Ayer JG, et al. Neonatal Ebstein anomaly: a 30-year institutional review. Semin Thorac Cardiovasc Surg. 2017 Summer. 29(2):206-12. [Medline]. Holst KA, Dearani JA, Said SM, et al. Surgical management and outcomes of Ebstein anomaly in neonates and infants: a Society of Thoracic Surgeons congenital heart surgery database analysis. Ann Thorac Surg. 2018 Sep. 106(3):785-91. [Medline]. [Guideline] Stout KK, Daniels CJ, Aboulhosn JA, et al. 2018 AHA/ACC guideline for the management of adults with congenital heart disease: executive summary: a report of the American College of Cardiology/American Heart Association Task Force on Clinical Practice Guidelines. J Am Coll Cardiol. 2018 Aug 10. [Medline]. [Guideline] Cotts TB. 2018 AHA/ACC guideline for adults with congenital heart disease. American College of Cardiology. Available at https://www.acc.org/latest-in-cardiology/ten-points-to-remember/2018/08/13/16/26/2018-aha-acc-guideline-for-the-management-of-achd. August 16, 2018; Accessed: October 25, 2018. Dearani JA, Mora BN, Nelson TJ, Haile DT, O'Leary PW. Ebstein anomaly review: what's now, what's next?. Expert Rev Cardiovasc Ther. 2015 Oct. 13(10):1101-9. [Medline]. Freud LR, Escobar-Diaz MC, Kalish BT, et al. Outcomes and predictors of perinatal mortality in fetuses with Ebstein anomaly or tricuspid valve dysplasia in the current era: a multicenter study. Circulation. 2015 Aug 11. 132(6):481-9. [Medline]. Characteristic chest radiograph of a neonate with Ebstein anomaly. The heart shadow demonstrates cardiomegaly, with evidence of severe right atrial enlargement. Surgical repair of Ebstein anomaly as described by Danielson. (A) The right atrium is incised and reduced, and the atrial septal defect is closed with a patch. The arrow identifies the large anterior leaflet. (B) Mattress sutures with felt pledgets are used to pull the tricuspid annulus and valve together in a horizontal plane, obliterating the atrialized right ventricle. (C) Sutures are tied after all have been inserted. The arrow identifies the septal leaflet. (D) A posterior annuloplasty is used to narrow the orifice of the tricuspid annulus. (E) Completed repair, resulting in a competent tricuspid valve. Surgical repair of Ebstein anomaly as described by Carpentier. The anterior and posterior leaflets are detached from the tricuspid annulus. In type D lesions, fenestrations are used to create interchordal spaces for the passage of blood into the right ventricle outflow tract (insert). Mattress sutures with pledgets are placed in a vertical plane to plicate the atrialized portion of the right ventricle (top right). The anterior leaflet is reattached at the level of the true annulus with a continuous running suture (bottom left). An annuloplasty ring is inserted to reinforce the repair (bottom right). Surgical repair of Ebstein anomaly in the neonate as described by Starnes. The atrial septal defect is enlarged by excising the remaining septum. The tricuspid valve orifice is closed with a Gore-Tex patch, effectively creating tricuspid atresia. A Gore-Tex shunt (not shown) is then placed to connect the innominate artery to the right pulmonary artery. PTFE = polytetrafluoroethylene. Surgical replacement of the tricuspid valve in Ebstein anomaly. (A) The atrialized right ventricle is plicated in a horizontal plane. (B) Sutures are placed on the atrial side of the coronary sinus and atrioventricular node to avoid injury to the conduction system. (C) Sutures are tied with the heart beating and perfused to ensure the conduction system is intact. Surgical replacement of the tricuspid valve using a pericardial patch to avoid injury to the conduction system. The valve insertion is begun anterior to the coronary sinus using a continuous running suture. A glutaraldehyde-treated pericardial patch is sutured to the septal portion of the prosthetic valve sewing annulus. The free margin of the patch is then sutured to the atrial tissue beyond the area of the conduction tissue. AV = atrioventricular. Operative steps for Ebstein anomaly repair. (A) Opened right atrium showing displacement of the tricuspid valve. 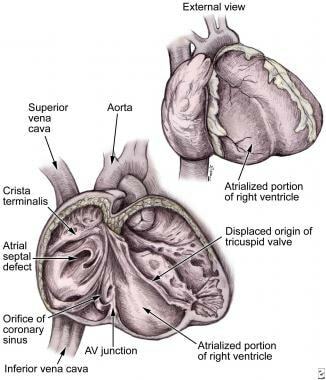 ASD = atrial septal defect, CS = coronary sinus, TTA = true tricuspid annulus. (B) Detached part of the anterior and posterior leaflet as a single piece. (C) Clockwise rotation of the posterior leaflet edge to be sutured to the anterior leaflet septal edge and plication of the true tricuspid annulus to bring the valve to a uniform level. (D) Completion of valve attachment to the true tricuspid annulus and closure of the atrial septal defect. Used with permission from Elsevier (Fig 1 from Da Silva JP, Baumgratz JF, da Fonseca L, et al. The cone reconstruction of the tricuspid valve in Ebstein's anomaly. The operation: early and midterm results. J Thorac Cadiovasc Surg. 2007 Jan;133(1):215-23). The cardiac silhouette is usually enlarged in Ebstein anomaly. A chest radiograph will usually show an enormous shadow of the right atrium. Pathology of Ebstein anomaly: Dilated right atrium (RA) with inferior displacement of an abnormal tricuspid valve (TV) septal leaflet, which results in a small right ventricle (RV) that is atrialized. ASD = atrial septal defect, LA = left atrium, LV = left ventricle, PA = pulmonary artery, R-L = right to left.